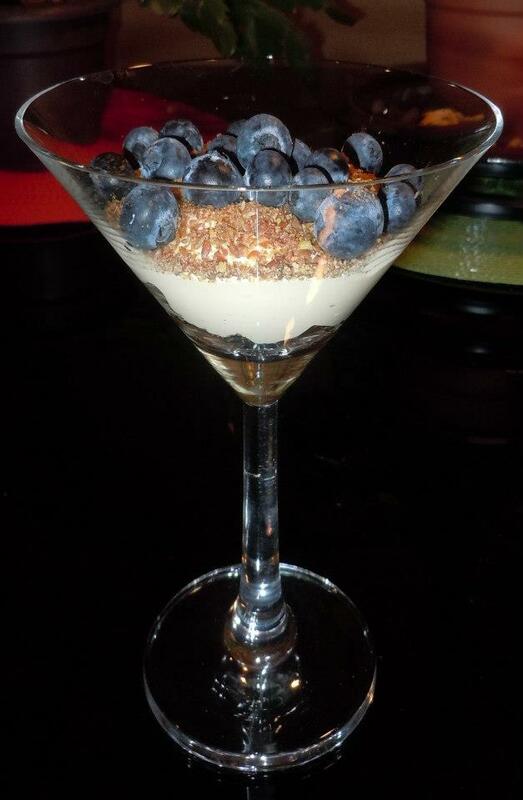 This is an adapted recipe from “The Oil-Protein Diet Cookbook” by Dr Johanna Budwig. 1. On med-lo heat, gently heat 3 cups water. 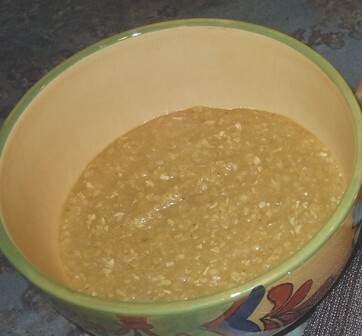 As it warms, add the buckwheat, onion and bouillon and let soak for 30 minutes, stirring occasionally. 2. Add sea salt and Bragg’s liquid amino to taste. Add nutritional yeast and spices, and stir until dissolved. 3. Remove from heat. Add garlic, flax oil, and herbs of choice. Stir well and let sit for 2 minutes to let flavors mix. An incredible tropical dessert that is dairy-free, and made from healthy ingredients! 1. Saute pineapple slices in coconut oil over med-hi heat and sprinkle cinnamon and cloves on top. Cook until softened, rotating the pieces every few minutes. 2. Stir in the coconut palm sugar and lime juice until dissolved. Turn off heat and let sit for a few minutes so the pineapple can absorb the flavors. 3. 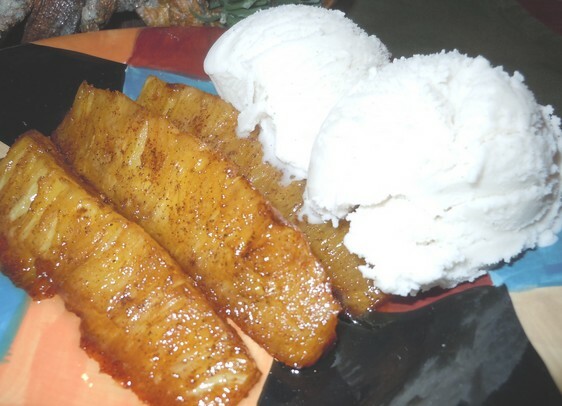 Serve on a pretty dish with “Purely Decadent” coconut milk vanilla bean ice cream and sprinkle with coconut flakes! Posted in Dessert, Easy, Uncategorized. 1. Heat coconut oil over med-hi heat, cook ginger and garlic for about 5 minutes. Season the salmon with with sea salt and dill, then pan-sear on both sides. 2. Meanwhile, trim fronds from fennel bulb. Slice bulb into thin slices, then dice into smaller pieces. 3. Make dressing: whisk together the mustard, sugar, olive oil, lemon juice and chia seeds. Add diced fennel and 1 tbsp chopped fennel fronds or dill, toss with dressing. Season. 4. Make a bed of raw spinach on a plate. 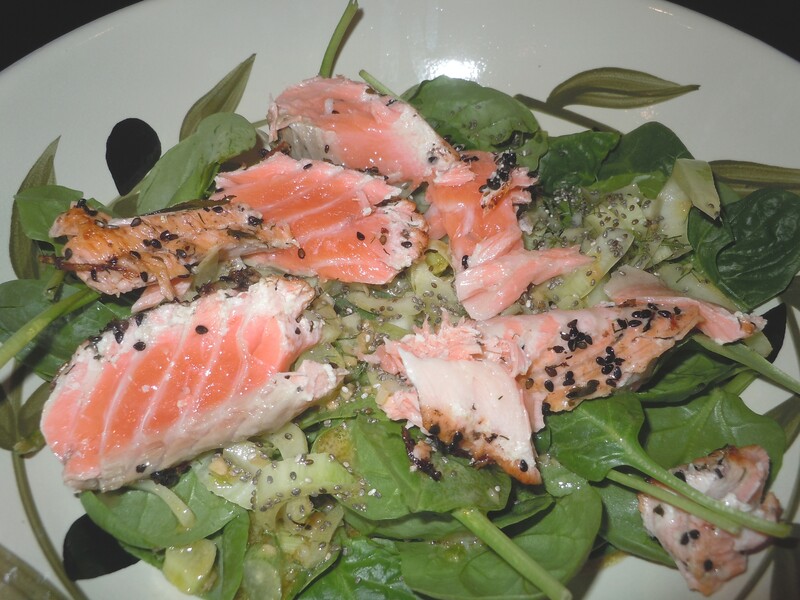 Top with sliced, pan-seared salmon, and pour olive oil dressing on top. Sprinkle with black sesame seeds. Posted in Dinner, Recipe of the week.